The U.S. flag flies at half-staff in honor of former President George H.W. Bush outside the Capitol in Washington, D.C., Monday. Top Hill leaders planned on a stopgap funding bill to avoid a partial shutdown at the end of the week. That gives negotiators an extra two weeks to finalize legislation to fund roughly a dozen agencies, including critical areas like the State Department and the Departments of Homeland Security and Transportation. But it is the fight over money for President Trump's planned wall on the U.S. border with Mexico that has been the main sticking point in the talks so far. President Trump is demanding $5 billion for the wall, but top Democratic leaders say they can't support that level of money. After Bush's death late Friday, top Hill leaders decided they didn't want to disrupt the Washington remembrances of the former president with a food fight over immigration — a divisive issue with hardened positions on both sides. 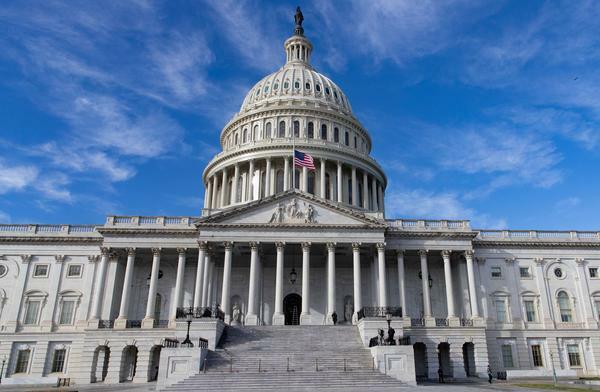 Instead the new plan is for the House to unanimously approve the two-week spending stopgap before sending it to the Senate for final approval before the deadline at the end of the week, according to several Congressional aides familiar with the talks. Negotiators have been working on a spending bill for several weeks on a range of issues, but have made little progress on discussions about the wall. Most legislation requires 60 votes on the Senate floor, meaning Republicans — who currently hold a narrow two-seat majority — will need Democrats to help pass any spending bills. Senate Minority Leader Chuck Schumer told reporters last week that he was willing to work with Republicans on up to $1.6 billion in new border security funding, but that falls far short of Trump's immediate demands. "If there's any shutdown, it's on President Trump's back," Schumer said. "Left to our own devices, the Senate and House could come to an agreement." Schumer and House Minority Leader Nancy Pelosi were scheduled to meet with the president on Tuesday, but that sit-down at the White House was postponed until next week. Senate Appropriations Committee Chairman Richard Shelby, R-Ala., said Republicans are now pushing for $2.5 billion in wall funding this year, combined with an additional $2.5 billion to be allocated next year. That's $900 million more than Democrats will accept. Shelby said the current offer doesn't include any incentives, like a long-term extension of the Violence Against Women Act or the chance to vote on a bill to protect special counsel Robert Mueller, to entice Democrats to accept the increased wall funding. "I think most of them would want to pass our appropriation bills," Shelby said. "Now the question is, are they willing to shut it down over this. We're trying to avoid that." The Austin-based nonprofit that houses more migrant children than any other organization in the country plans to hire an independent attorney who will conduct a "comprehensive internal review" of issues outlined in an investigative story by The New York Times.